Poet Emma Sovich: I hoped that the artist would surprise me, and she certainly did. I suppose the obvious things (for me) to pick up from the poem would’ve been the sailfish, jewelry, blue, even the elephant (I so hoped not the elephant, even though, uh, Roll Tide). Artist Kara Searcy: The strength portrayed by the grandmother at the end of the poem delighted me. I wasn’t expecting it to be there in a poem that began with greif. Poet Emma Sovich: This may sound strange, but I never really thought of this as a domestic or nostalgic poem until it got paired with this art. I think the art grounds the poem in an undercurrent of emotion the poem itself has difficulty expressing or allowing itself to acknowledge. Artist Kara Searcy: When I started working on photographs for this piece I kept thinking about how I have access to fish skeletons, live fish, etc., because I have family members that are biologists. Even though my photographs of those things were definitely interesting, they stuck too close the poem, and I wondered what it might look like to have a photograph that didn’t seem to directly relate to the poem, but could if the reader/viewer gave it some thought. 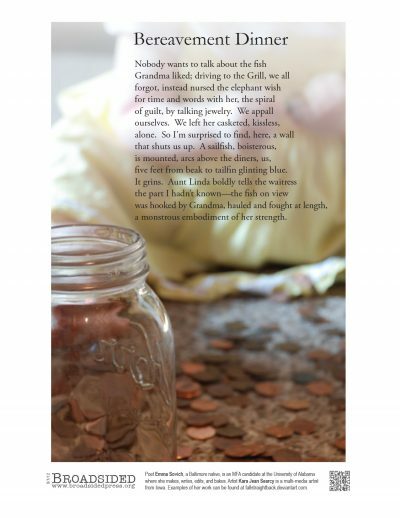 I was thinking about the author’s perspective verses a reader’s perspective, and that’s when I decided on photographing a child in a pile of pennies. I think the mood the photograph creates plays nicely off the mood the poem creates. Poet Emma Sovich: The child or doll startled me. One of my grandmothers has an extensive doll collection, and the pennies evoke a number of childhood memories for me, so it felt rather apt and personal in a surprising way. Artist Kara Searcy: I was surprised by how the photograph seemed to take on a kind of hopefulness which was contrasted by the melancholy mood the poem initially starts out with. Poet Emma Sovich: Yes, often and obsessively. Sometimes it’s to pull myself away from an inclination toward the overly personal. Sometimes it’s because some image or figure from a visual work occupies a space in my brain and creates a new life for itself. If you had to represent the Broadsided of “Bereavement Dinner” with one word, what would it be? Poet Emma Sovich: Well, I’m in the middle of production for my first issue of Black Warrior Review as editor, so I’ve mostly been reading all the excellent work we’ve curated for that. Also, I’ve been rereading Lily Hoang’s The Evolutionary Revolution which is one of the books that changed how I felt about fiction and poetry (and life in general). Poet Emma Sovich: This falls into the category of good books, too (and the collaboration category): Build Your Own Presidentby Matthew Swanson and Robbi Behr of Idiots’ Books has fun and mix-and-matchable art (idiotsbooks.com), and their book From the Inside Out (which is older, but I reread recently) has haunting, evocative art that magnifies the emotional impact of the story. Poet Emma Sovich: I’ve loved Broadsided since I discovered it 2007 or 2008, and I’m thrilled and honored to be part of it. I worked for a time making letterpress broadsides to commemorate visiting writers for my alma mater, and so the broadside as a medium is important to me. This is such a fascinating and fun way of keeping broadsides alive and kicking—and promoting collaboration and user-participation. So, a huge thank you to the editors! Oh, and thanks Kara Jean Searcy! Poet Emma Sovich, a Baltimore native, edits Black Warrior Review and is an MFA candidate at the University of Alabama. She makes, writes, reads, and bakes in a house in a graveyard. Find work of hers at PANK, The Battered Suitcase, and Ampersand: Journal of the PCBA, among others.